The year is 1849. In Italy, Giuseppe Garibaldi is fighting to defend the Roman Republic, which has fallen to the French Army. On the morning of August 3rd, after a night of bombings, Garibaldi is forced to disembark in Magnavacca. With him are only Major Leggero and Anita, his wife, severely ill with fever. The Austrian patrols are already moving: The hunt is on. Garibaldi recreates the events of August 1849 in Romagna, when Guiseppe Garibaldi, chased by Austrian patrols for a fortnight, managed to hide in valleys and woods and to reach safety in the nick of time. 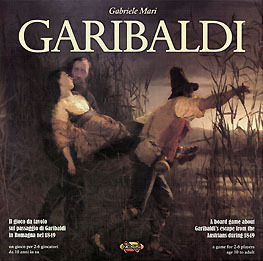 Garibaldi is a gripping bluffing game suitable for the entire family. Garibaldi is not only an exciting board game, but also an educational tool that will help players, especially young children, develop a passion for History in a new and fun way.